The background of this fur changes gradually from warm grey to brown and back again. It has a slick texture to it. 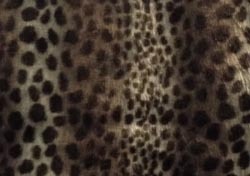 The spots on this fur are about 1/2" .